Member of the Konohana Family, a Japanese spiritual community which applies the Universal Circulation Method based on the Katakamuna civilization that existed in East Asia about 13000 years ago. She is responsible for international communications and also serves as the president of “Green Grass”, a non-profit organization. Abstract: In order to bring true peace to the Earth, what is the thing we can do now? We can have a broad worldview and transcend the individual ego. When people are trapped in the narrow perspective of the ego, they start to sense a distance in others by differences. That is the beginning of conflicts and wars. However, the world where we exist is infinitely vast and consists of the network of various lives. That network of harmony is based on the fractal structure that the whole exists for the individual and the individual exists for the whole. We have entered the 21st century and faced some great turning points. The sun orbits the Milky Way galaxy every 226,000,000 years and spirals about 9000 times in the interval. One spiral takes 25,800 years. We had the winter solstice of the galaxy in 25,800 years on December 21st, 2012 and shifted from the times of darkness and conflict to the times of light and harmony. Moreover, Pluto orbits the Sun every 248 years. In 2008, Pluto made a circuit which led to the end of the Western material civilization that continued for 250 years from the Industrial Revolution. And now, the time has started when the Eastern spiritual civilization will blossom. We have already entered the stage when each person becomes aware of the truth from the universal viewpoint. Therefore, many people have started to question the traditional values. Values of a new era are required. Each person’s spiritual revolution changes the country and the world. Changing yourself is the beginning of changing the world. That is the universal will and the expression of the cycle of the times. Therefore, all the events that occur at the individual, national and global level are also the universal will and the flow of the times. The perspective needed to read the times in that manner is possible by freeing ourselves from our individual egos and having a broad worldview. Humans are going to reach that conscious level within the 21st century. Now, we are facing the turning point at which we will either trigger the next extinction for earth-living beings, or will create a new era. When humans express the spirituality the next era indicates, peace will naturally prevail on Earth. Keywords: Earth, True Peace, Broad Worldview, Turning Point, Spiritual Revolution. In order to bring true peace to the Earth, what is the thing we can do now? Firstly, we need to have a broad worldview and transcend the individual ego. When people are trapped in the narrow perspective of the ego, they start to sense a distance in others by their seeming differences. That is the beginning of conflicts and wars. However, the world that we exist in is infinitely vast and consists of a network of various lives. That network is based on the fractal structure that harmonizes the whole within the individual with the individual in the whole. When we recognize our existence this way, there are two viewpoints—a viewpoint of looking at the macrocosm of the exterior and interior of ourselves and the other viewpoint of returning to our position as a microcosm of this world. The truth of this world is that everything is ONE. Therefore, there is no boundary between everything else and ourselves. As worldviews expand in this matter there will inversely be a unification between self and others, which will inspire a greater sense of community and reduction in conflicts. Peace will naturally prevail on Earth without the forcible creation of peace. There is a Chinese character of “Hataraku” in Japanese, which means “work.” However, the distinct meaning is to “make others (Hata) comfortable (Raku)”[i]. Working means to be living with a sense of wholeness, and to play a role in a network beyond ourselves. Therefore, existence is naturally harmonious in its’ intended function. One of the reasons why society contradicts peace is that it reinforces the ego of production. In the current society, national and individual agendas restrict the maintenance of peace and encourage conflicts; such as war, discrimination, and ideological valuation. The Earth consists of a network of life that sustains all living beings and connects them in a healthy manner. In order to do so, the law of the universe functions through the co-existence of other planets. However, various contradictions occur on Earth through the construction of human society. Moreover, it influences the extinction of many living beings indifferent of the industrial determination. The reflection stems from a narrow self-concept and worldview, which manifests throughout the Earth. Looking at the history of the evolution of living beings on Earth, six great extinctions have occurred in the past 600 million years. The previous extinction occurred about 65 million years ago and it is said that there is the possibility of another extinction in the near future[ii]. According to the statistics, we can say that we are going toward an extinction right now. Each extinction occurs due to a different reason. There is a real possibility that humans are bringing the next extinction by going out of control. Looking back in history, the first living being was born on Earth 3.8 billion years ago[iii]. And our ancestor, Homo sapiens emerged only 200,000 years ago[iv]. This species was extremely capable, adaptable and special out of all other living beings that had existed on Earth. Their great ability has been proven by admiring at the current world created by humans. In a sense, we humans are the masterpiece of all living beings on Earth. It is humans that have the highest ability and biggest influence of all the earth-dwelling creatures from the past to the present. However, the great human ability is like a double-edged sword. If people continue to use it for their egos, they might bring about the next extinction. On the contrary, if they use it effectively, they have the possibility of contributing toward an advanced world, and overcoming the extinction crisis that is occurring currently. We have entered the 21st century and faced some great turning points. The sun orbits the Milky Way galaxy every 226,000,000 years and spirals about 9000 times in the interval[v]. One spiral takes 25,800 years[vi]. We had the winter solstice of the galaxy in 25,800 years on December 21st, 2012 and shifted from the times of darkness and conflict to the times of light and harmony. Moreover, the Mayan calendar with the history of 13,000 years ended on that day. This means that the Mayan people who took over the civilization of time from the Mu continent, understood such a universal and solar structure already from the ancient times. As well, the Katakamuna people brought about their civilization based on the soul of language from the Mu continent which flourished in Asia according to a systematized and advanced cosmo-physics[vii]. 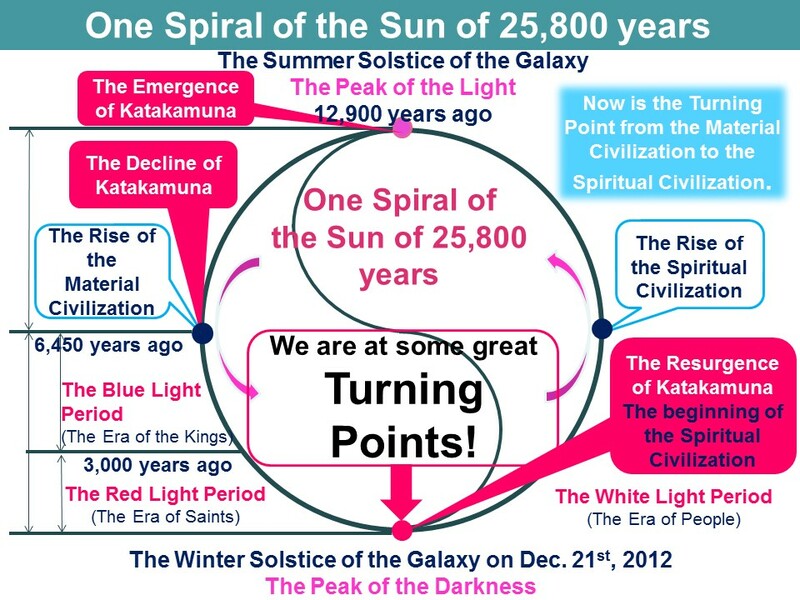 When we analyze the transition of civilizations on Earth from the Katakamana viewpoint, we are able to clearly recognize the cycle of emergence, development and disappearance of civilizations. And it matches perfectly with the modern cosmo-physics and the astronomic observational data. Approximately 12,900 years ago is a half cycle of one solar spiral which is when the Katakamuna cosmo-physics reached its peak. The summer solstice of the galaxy arrived 12,900 years ago and it was the peak of light from the universal viewpoint. Then, the Katakamuna civilization that reached the peak declined and the modern material civilization emerged 6450 years ago. It became the base of current religions and economic systems. Therefore, the values of the modern society began 6450 years ago and have now reached their peak now. Furthermore, according to the ancient Chinese calendar, “the Blue Light Period”, during which kings governed the world began 6450 years ago. After the era of the kings ended, the next 3000 years was the era of the saints, called “the Red Light Period.” It was an era when people were guided by great saints[viii]. However, even though they were the same people, the gap between saints and people who were not awakened emerged at the same time. This has led to the modern politico-religious governance of the world, which has spanned such ideologies as capitalism and communism. More so, people became commercialized through this model of being and lost their unique personalities, satisfaction, and inherent values of worth to homogenized social structures. On December 21st, 2012, the solar system had the winter solstice of the galaxy which passed the peak of darkness, which involves the least amount of light in one solar spiral[ix]. Now we have entered a time when the light has started to shine from this peak of darkness, which is also related to the global spiritual darkness. People cannot see the truth in the darkness, therefore things that once were right and functional have brought confusion to society. People have insisted upon themselves and have made conflicts in order to seek their own happiness. As a result, the abundance that only some people receive has created the gap between the rich and poor and has spread poverty and conflicts around the world. Without any other standards of truth, routinized suffering became normalized. Symbolizing the era of darkness, the peak of one Pluto’s spiral occurred in 2008, where Pluto made a circuit of 248 years[x] marking the end of the Western material civilization that has continued since the dawn of the Industrial Revolution. People have developed Western science, physics and technology from the Industrial Revolution, which has inspired economic growth, a global population explosion, and the ignorance of the natural environment. As a result, this has brought various issues upon the Earth, climaxing at the Western civilization’s peak. Accordingly, every tide has its ebb which describes the subsequent decline of this material age. Now that the Western material civilization has reached its peak, the era has started when the Eastern spiritual civilization will blossom[xi]. This means two things: that we are going to shift from the times of material abundance toward one of spiritual abundance, and from the times of competition and conflict to those of harmony. This age relates with the activation of magma through the intensification of solar energy upon the Earth[xii], which inaugurates an environmentally severe era for the future. The calamities and natural disasters that have, and will, befall the current age imply the harmonious union of people, wherein physical desires will be curtailed along with the creation of spiritual abundance. Only when people transcend their individual ego and human minds become harmonious will natural disasters settle on Earth. With this statement, all phenomena are messages from the universe to humans. On top of that, according to the ancient Chinese calendar, we have entered the era of people called, “the White Light Period”, which has progressed from the Blue and Red Light Periods[xiii], this means that we have reached the stage where each person will become self-aware and become Buddha or Christ like. It is this figure of humans expressed in the 21st century that ennobles us to forecast a broad worldview, with a humbled ego of precious existence for the world. We have already entered the stage when each person becomes aware of the truth from the universal viewpoint. Therefore, many people are beginning to question their traditional values, which are not currently reflected in traditional education, and bring about this new era. Moreover, these systems are not achievable through traditional revolutions and will only progress naturally in time. Therefore, we should sense the change of the times, and allow the shift of consciousness to unfold in our ways and thinking according to this new era. With an individual spiritual revolution, countries and eventually the world will progress into the new era. Revolution requires not power but will to change with the times and harmonize with the universal will that flows through the individual, national, and global levels. The role that each person plays according to this will is revealed from within the awareness of a broad worldview. Although humans operate in a physically small container called the body, we are able to reach a level of consciousness where, ultimately, the whole universe is ourselves. That is to “remove (Tori in Japanese) the differences (Sa in Japanese)” between everything else and ourselves, which is commonly referred to as “enlightenment” (Satori in Japanese). This state is based upon the absolute goodwill, love, harmony, and boundlessness between everything and ourselves. Humans are entering into that level of consciousness within the 21st century, and within the next 1,000 years are transitioning from a time of material pursuit to untapped potentials. The most dormant part of the human brain is ripe with the intuitive capacity to sense the universal will and flow with the times, which will unravel the hidden possibilities of advanced technologies with a highly spiritual functionality. The 21st century is the beginning of the time when we humans have consciousness as an Earth being and as a universal being, all to make a contribution to this world. Now, we are facing the turning point at which we will either trigger the next extinction for earthly beings or we will create a new era. When humans express the emerging spirituality of the next era, peace will prevail on Earth.